Last November, Whitman returned to Ilha de Maré during a four-week photographic journey through Brazil. As he was walking along the same road where he’d encountered Jefinho and Darlei six years earlier, he passed two boys—about the same age as the marble players had been—seated at a cement table. He gave them each a keyring from Miami, and asked if he could take their picture, the first shot of the day. That photo, “Best Friends,” is now the announcement for an upcoming exhibit of Whitman’s work, in Miami, called “Luminous Youth.” Reviewing an exhibit of Whitman’s work in Berkeley, California, Stephanie Hornbeck, now a conservator at the National Museum of African Art, wrote, “Whitman’s photographs evoke a gentle world. Beneath leafy trees in sunny, seemingly carefree settings by the sea, warm smiles and bright eyes engage the viewer directly. He focuses on the inner warmth and outer beauty of his young subjects, separating them from their often sad circumstances.” “Luminous Youth” runs from September 9 to November 2 at the Marjory Stoneman Douglas Biscayne Nature Center in Crandon Park, Key Biscayne. The opening reception is on Sunday, September 9, from 3 to 6 pm, with Brazilian music performed by Rose Max and Ramatis. Read more. Read more about Peace Corps Saint Lucia. Read more about Peace Corps Brazil. Read more about Photography and the Peace Corps. Read more about Peace Corps Exhibits. PCOL will not be in DC tomorrow morning to cover the hearings live but Senator Dodd's office has informed us that the hearings will be webcast and we will be watching them live and reporting on them. The link to the video will be on Senator Dodd's Home Page and will begin about 15 minutes prior to the hearings. We will be providing copies of all the witnesses' statements on our web site and photos from the hearings. 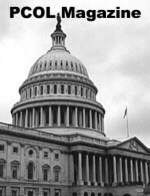 Read a copy of the proposed legislation. Read Senator Dodd's remarks on introducing the legislation. CSPAN has informed us that they probably won't be televising the hearings but that they are still finalizing their schedule. 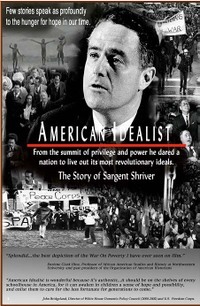 Maryland Returned Volunteers invites you to a special advance screening of the inspiring documentary American Idealist: The Story of Sargent Shriver on Saturday, March 3 at 7:00 p.m. at The Shriver Center, UMBC. Sargent Shriver has arguably touched more lives than any American since Franklin Roosevelt. Television journalist and former LBJ aide Bill Moyers calls him “the best all-around politician I’ve ever seen.” Yet, Shriver remains unknown to most Americans today. During his tenure in the Kennedy and Johnson administrations, Shriver created the Peace Corps, directed the War on Poverty, and served as U.S. ambassador to France. The programs he created—including the Peace Corps, Head Start, Legal Services for the Poor, VISTA, Job Corps, Foster Grandparents, and Special Olympics—have improved the lives of millions. Sarge’s story offers both a guiding paradigm and a source of inspiration for those who wish to serve. Learn more about Sargent Shriver, founding Director of the Peace Corps. Filmmaker Claude von Roesgen announces that "Jimi Sir," an original and intimate portrait of Peace Corps volunteer James Parks' experiences as a high school science, math and English teacher during the last 10 weeks of his service in Nepal, is now available for free viewing on "Google Video" at: Google Video: Jimi Sir. The film is also available for purchase on DVD at Amazon. "Jimi Sir" has been called the best movie ever made about the Peace Corps experience. Take a journey to the rugged terrain that separates the barren Tibetan plateau and the plains of India. Live alongside Jimi, a Peace Corps volunteer in Melung, a days walk south of the trail from Kathmandu to Mt Everest base camp. Delve into the ways of the Tibetan Buddhist people living and farming side by side with the Hindu Sanskrit culture. Witness the Buddhist prayer wheels and flags alongside the Hindu puja rituals. Understand the challenges facing Nepal as its citizens struggle with overpopulation, deforestation, and drinking water quality. Celebrate the festival of Tihaar, a tribute to the animals. Watch Jimi as he strives to finish a water quality and educational development projects before the deadline of his completion of service. Benefit from Jimi's two years of Peace Corps experience in Nepal as a high school math/science and English teacher by seeing Nepal through his eyes. Jimi speaks Nepali fluently and brings you into the culture. Come to understand what it means for a Westerner to spend two years in the Middle Ages where there are no roads, vehicles, electricity, plumbing, telephone or radio. Experience Jimi's unique perspective on our Western way of life. A must see for anyone interested in visiting Nepal or has traveled there themselves. You'll feel like you're back in this enchanting land of mountain peaks that reach as high as the highest thunderheads. With rivers that churn their way furiously through narrow valleys flanked by rice paddies rising thousands of feet above the river bed. If you're a returned Peace Corps volunteer, interested in becoming a Peace Corps volunteer, or know anyone who did Peace Corps service you'll definitely want to watch "Jimi Sir." Read more about RPCV Documentary Filmmakers. "My name is David Lotti. Stephen Lotti was my son who died in the plane crash in Peru 8/23/05. My attorney would very much like to contact Ms. Monica Glenn and talk with her about that day. Since both Steve and Ms. Glenn served in the Peace Corps we feel that at some point in the flight they may have made a connection. If you have a means of contacting her, please have her contact me at jblotti AT comcast.net OR David M. Lotti 115 Ashton Park, Peachtree City, Ga 30269. Phone 770-486-8502. Thanks for your help in this matter." RPCVs Monica Glenn and Steve Lotti were traveling separately on a flight in Peru in 2005 that crashed near Pucallpa. Steve Lotti lost his life while Monica Glenn and her husband survived with second degree burns. Monica Glenn served as a volunteer in China, her family is from the Orange County area, and her husband William Zea-Palacios is Bolivian. They were living in Arequipa, Peru a year and a half ago. If anyone in the RPCV community knows how to get in touch with Monica Glenn, please pass this message on to them. Tune into "the Intersection" with Rebecca Roberts on WETA 90.9FM at 11 a.m. EST on Thursday, December 21 to hear a discussion with new Peace Corps Director Ron Tschetter. 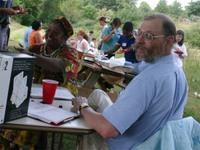 Calls and emails from returned volunteers and the Peace Corps community are welcome. You can listen to the program live over the internet by going to http://www.weta.org/theintersection/ and click the button that says "Listen live to 90.9FM." Read more. 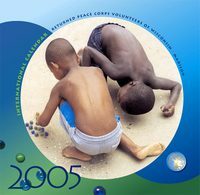 Peace Corps Writers is seeking submissions for new book "Letters Home from the Peace Corps"
Peace Corps Writers (www.PeaceCorpsWriters.org) has agreed to edit and publish a collection of correspondence of Peace Corps Volunteers as part of the celebration of the 50th anniversary of the Peace Corps. Letters Home from the Peace Corps will be one way for Peace Corps Writers to preserve the history of the Peace Corps. Your letters and emails to family and friends are treasured documents that must be saved because they offer valuable insight into the experience we all shared. Your personal correspondence tells a story, and with this book, we hope to preserve your story — as expressed in your own words — for posterity, and we ask you to share them with us. While we prefer to see previously unpublished material, letters and/or emails that have already appeared in local newspapers, self-published books, and/or family web sites are all acceptable. In selecting a letter or email to be considered for publication in the book, we ask that you choose it thus: Would a reader find the letter intriguing? . . . dramatic? . . . humorous? . . . historic? . . . insightful? If you can answer yes to one of these questions, please send it. We will select the very best letters that tell the story — through the eyes of PCVs and Staff — of the Peace Corps since its beginnings in 1961. Your letters can be about any aspect of the Peace Corps experience: Making the Decision to Join, Training, Peace Corps Service, Friends, HCNs, Family Visits, After the Peace Corps, Life as an RPCV, Returning to the Host Country. Send us no more than three of your best letters or emails. Select the letter(s) that have the most meaning to you; that tell a story you want to tell.